If that’s the case, the governor and legislators need to do better by the state’s university and community college faculty than the one-time 3% bonus McCrory recommends for them. The governor deserves credit for some of his education proposals – an average 5% raise for K-12 teachers, bringing average teacher pay in North Carolina to $50,000; plus a 3.5% bonus for teachers, with $5,000 for teachers with at least 25 years’ experience. He offers $2 million for scholarships for 300 prospective math and science teachers, and $5 million for merit scholarships for students pursuing science, math and health degrees. But instructors in the classroom are the heart of any university or community college – they ignite fires of curiosity in their students. 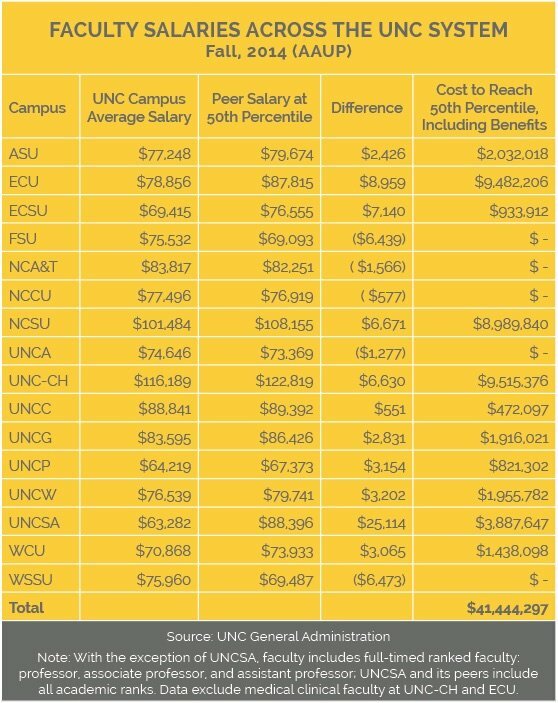 And faculty at North Carolina’s public universities have seen a single raise of 1.2% from the General Assembly in the past seven years. The governor’s budget does include $3 million to recruit and retain “exceptional” faculty who receive competing offers. University System President Margaret Spellings told legislators this week that pay for faculty and staff is her top priority for the legislature this year. “On every campus visit, this challenge comes to the fore: We can’t attract and keep world-class talent if we don’t offer competitive pay,” Spellings said. But we need to reward the people who teach our kids at every level. 1 https://ncosbm.s3.amazonaws.com/s3fs-public/documents/files/BudgetBook_2016-17_2.pdf, Governor’s Transmittal Letter, p. 3. 3 http://www.northcarolina.edu/apps/bog/index.php?mode=browse_premeeting&mid=5630&code=bog, 2016-17 Budget Priorities, p. 26. One thing is glaringly omitted from the proposed budgets. We retirees have received just 2% in cost of living increases in the past 5 years. That means that we are in rather desperate straits. Why? It’s simply because the consumer price index for the past 5 years sits at 12.5 %. One need not be a terribly accomplished mathematician to solve that equation. We are now 10.5% less well off than in 2010. Add in no increase for us this year, and factor in the inevitable CPI increase, and it’s going to be worse for us—much worse. We’ve been denied for far too long. Throw the peasants some crumbs please! While I agree that our teachers and faculty all need to be compensated for their work, so do the administrative staff. Everyone talks about the teachers, the teachers, we can’t do it without them and everyone completely forgets about the administrative staff who have not had raises either. If the stink about the raises given to the heads of the University had not been so loud, the majority of the raises given this past year to those who were at less than 90% of their pay grade, would not have occurred. While that was great, the “equity” piece that HR folks toss around when asked about raises, goes by the wayside and those of us who have been working for many, many years were looking at people with less experience and years of work making the exact same rate of pay. Where is the equity in that? It’s time merit raises were given back to the University system and government system to allow for raises that truly mean something instead of the indiscriminate across the board throwing of money at employees. I agree about the lack of a COLA, retired, out of sight out of mind. I find it interesting that the Gov proposes money for students to become math science teaches, when the GA couldn’t wait to cut out a very successful NC Teachig fellows program. The shortage of teachers is becoming a reality as we speak.